If you have enrolled in this, you may want to read the linked article. Also, you can find more articles here. 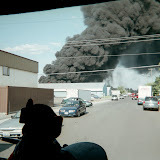 NARRATIVE: On 5/31/08 at 12:07 A.M. the Spokane Fire Department responded 3 engine companies, a pumper ladder company, 1 ladder company, 1 rescue unit and 2 battalion chiefs to a house fire located at 2908 E. Hoffman. Upon arrival, fire crews found a wood frame structure that had fire coming through a portion of the roof as well as a side window and door. Engine 15's crew, the first to arrive, immediately attacked the fire while also asking for backup and a crew to ventilate the roof. It was soon determined that both adult occupants had made their safe escape from the home. As the firefighters worked their way through the home to attack the fire, they soon found that the fire was mainly involving a portion of a laundry room, including the walls and ceiling immediately surrounding this area. The fire was also rapidly extending vertically into the attic. Through their fast and aggressive actions, the firefighters were able to knock down the fire and confine it to the back portion of the home. The majority of the home was saved, however smoke damage was extensive throughout the building. A total of 21 firefighters responded to this call and it took them 30 minutes to effectively contain the fire. Fire crews remained at this incident until 3:00 A.M. conducting final extinguishment and making sure all of the "hotspots" were completely out. This was accomplished by the use of thermal imaging cameras, shovels, chainsaws and axes. The attic insulation consisted of paper, sawdust and cellulose which kept firefighters digging for hotspots for a long time. The Spokane Fire Department Special Investigation Unit was called in to investigate the fire cause. At this time, the incident is still under investigation. There were no injuries to firefighters or civilians. The Red Cross arrived to take care of the two displaced tenants that resided in the home. The home suffered extensive smoke damage throughout and the home also sustained fire damage to the laundry and bathroom areas as well as extensive damage to the roof. It was reported that one of the tenants had smelled smoke and woke up the other tenant. The home did not have a smoke detector. Because this fire occurred at night during sleeping hours and because the home did not have a detector installed, the residents were extremely lucky that they woke up to the smell of smoke and were able to escape. This is not usually the case. Too many fatality fires occur because of a lack of working smoke detectors. Never rely on your senses to detect a fire. Install a working smoke detector on every level of your home. DAMAGE EXTENT: Extensive smoke damage throughout the home. The laundry and bathroom areas sustained fire damage as well as the attic and roof.